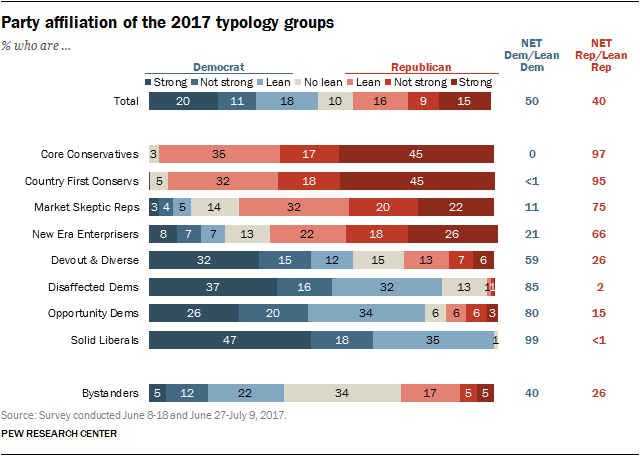 The eight typology groups fall into four Republican-leaning groups and four Democratic-leaning groups. While each group has a partisan orientation, there are substantial intraparty divides in how these groups view the parties, the president and other political figures. 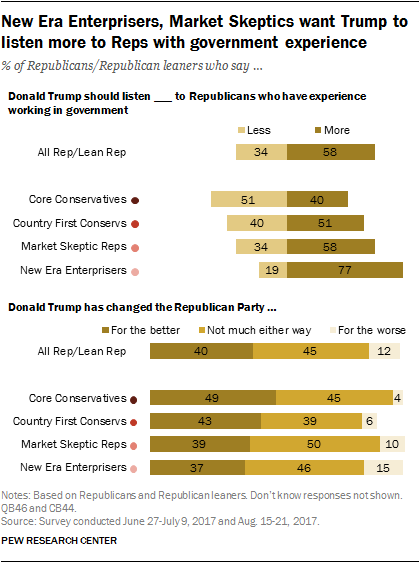 In the GOP coalition, Market Skeptic Republicans and New Era Enterprisers offer some criticism of the Republican Party and of Donald Trump, while Core Conservatives and Country First Conservatives tend to offer more positive evaluations of both. The divides are less pronounced among Democratic-leaning groups – particularly in their evaluations of Trump. Still, Devout and Diverse diverge from the other groups in the coalition by expressing less negative views of Trump and less positive views of the Democratic Party. Core Conservatives express the most positive attitudes about the Republican Party of any typology group. Among the other GOP-oriented groups, Market Skeptic Republicans offer the least positive assessments of the party. Overall, 90% of Core Conservatives say the Republican Party represents their values very or somewhat well, along with 75% of Country First Conservatives. A smaller majority (61%) of Market Skeptic Republicans say this. Only about half (51%) of Market Skeptic Republicans say the GOP cares about the middle class, compared with no less than seven-in-ten of those in other Republican-oriented groups. 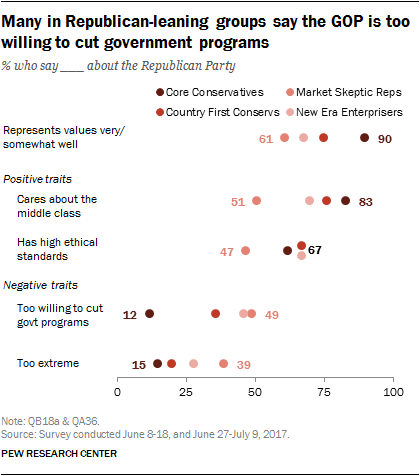 While only 12% of Core Conservatives say that the Republican Party is too willing to cut government programs even when they have proven effective, the share saying this rises among other groups in the GOP coalition: 36% of Country First Conservatives say this, along with 46% of New Era Enterprisers and 49% of Market Skeptic Republicans. Among Democratic-leaning groups, Solid Liberals are the most likely to say their values are at least somewhat well represented by the Democratic Party (90%). On the other hand, only about half (49%) of Devout and Diverse feel similarly. 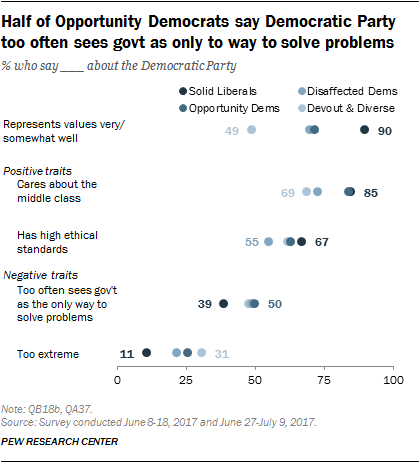 About seven-in-ten of both Opportunity Democrats and Disaffected Democrats (72% and 70%, respectively) feel that the Democratic Party represents their values at least somewhat well. There are relatively modest differences between the Democratic-leaning groups on other assessments of the party; most of those in all Democratic-leaning groups say the Democratic Party cares about the middle class, and majorities say the Democratic Party has high ethical standards. While Market Skeptic Republicans generally say the GOP represents their values at least somewhat well, they stand out for their criticism of both political parties when it comes to caring about the middle class. Nearly a third of Market Skeptic Republicans (31%) say the Republican Party cares about the middle class and the Democratic Party does not, while just 10% say the reverse. But this is the typology group most likely to fault both parties on this measure: 35% of Market Skeptic Republicans say that neither the Democratic Party nor the GOP cares about the middle class. 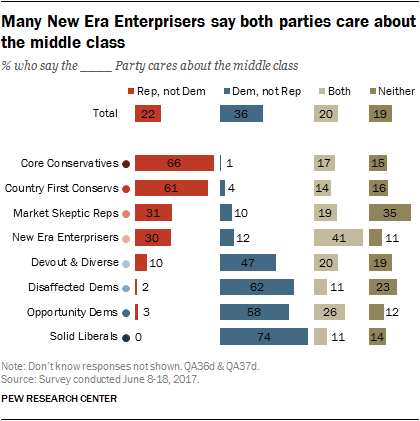 A relatively large share of New Era Enterprisers (41%), by contrast, say both parties care about the middle class; just 11% say neither party cares for the middle class. The other GOP-oriented groups are more divided. Among Market Skeptic Republicans, 56% say they agree with Trump on many or all issues, while 40% say they agree with him on a few or no issues. New Era Enterprisers are roughly evenly divided: 47% say they agree with Trump on many or all issues, while 53% say they agree with him on few or almost no issues. Among Democratic-leaning groups, more than nine-in-ten Solid Liberals (98%), Opportunity Democrats (93%) and Disaffected Democrats (91%) say they agree with Trump on only a few or no issues. A smaller – though still clear – majority of Devout and Diverse (74%) also say this. In general, just 16% of the public likes the way that Trump conducts himself as president, while an additional 25% say they have mixed feelings and 58% do not like his conduct. 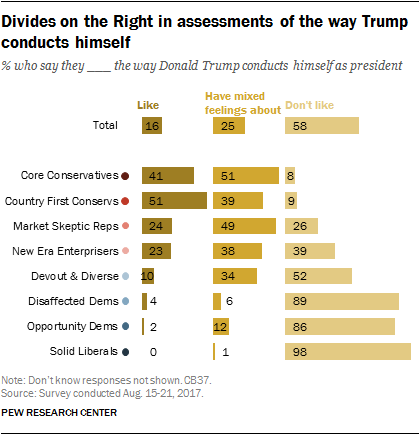 Trump receives his highest marks on this score from the two conservative groups: 51% of Country First Conservatives and 41% of Core Conservatives say they like Trump’s conduct, while only about a quarter in the other Republican-oriented groups say this. Among Market Skeptic Republicans, about half (49%) say they have mixed feelings about Trump’s conduct as president, while 26% say they dislike it. The share of New Era Enterprisers expressing dislike of Trump’s conduct is even higher (39%). Dislike for Trump’s conduct is overwhelming in three of the four Democratic-leaning groups: Solid Liberals almost universally (98%) hold this opinion, and large majorities of Disaffected Democrats and Opportunity Democrats (89% and 86%, respectively) don’t like Trump’s conduct. While few Devout and Diverse like Trump’s conduct (10%), their assessments are somewhat less negative: 52% say they don’t like how he comports himself, while 34% say they have mixed feelings. Among GOP-oriented groups, Core Conservatives and Country First Conservatives also are significantly more likely to ascribe positive traits – and less likely to ascribe negative traits – to Trump than other typology groups. For example, though majorities of all four Republican groups say “intelligent” describes Donald Trump at least fairly well, about nine-in-ten Core Conservatives (95%) and Country First Conservatives (93%) say this, compared with 70% of New Era Enterprisers. 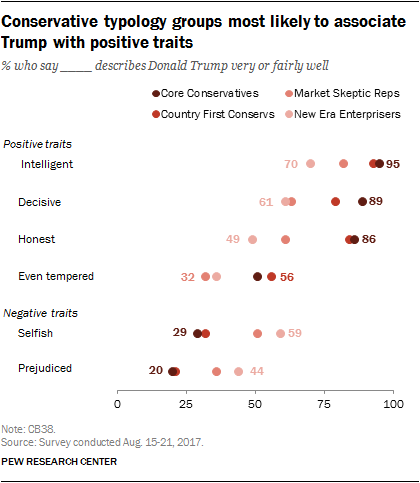 And while 86% of Core Conservatives and a similar share of Country First Conservatives (84%) say Trump is described very or fairly well as “honest,” that falls to a smaller majority (61%) among Market Skeptic Republicans and only about half (49%) for New Era Enterprisers. A similar pattern is seen on negative traits. 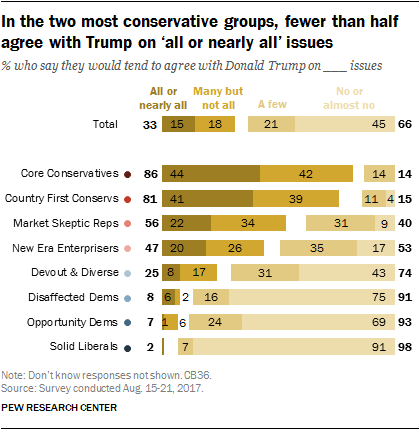 For example, about six-in-ten New Era Enterprisers (59%) and roughly half of Market Skeptic Republicans (51%) say “selfish” describes Trump at least fairly well, compared with only about a third of those in the two most conservative groups. Overall, 58% of Republicans and Republican leaners say Trump should listen more to Republicans with governmental experience, while 34% say he should pay less attention to them. 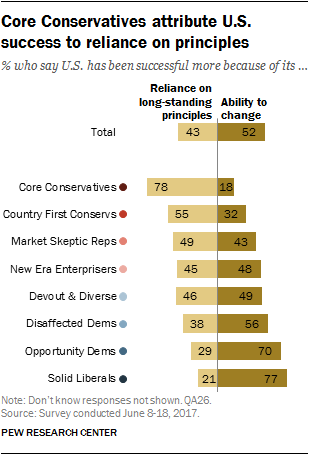 But these views differ across Republicans in GOP-oriented typology groups: Fully 77% of New Era Enterprisers say Trump should listen more to experienced Republicans, while just 40% of Core Conservatives say the same. There is a similar – but more modest – pattern in views on whether Trump has changed the party for the better, worse or not much at all. About half of Core Conservatives (49%) say he has changed the party for the better, compared with a smaller share (37%) of New Era Enterprisers. 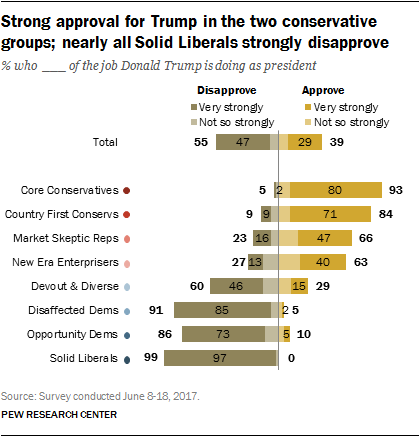 Donald Trump receives his most favorable ratings from Core Conservatives and Country First Conservatives: Roughly nine-in-ten in both groups view him favorably. Smaller majorities of Market Skeptic Republicans and New Era Enterprisers (64% and 62%, respectively) give him positive ratings. Overall, Vice President Mike Pence’s ratings among GOP-leaning groups roughly mirror Trump’s. However, Core Conservatives are more likely to be very favorable in their ratings of Pence than of Trump (50% rate Pence very favorably; 36% give Trump the same rating). Across all four GOP-leaning typology groups, wide majorities express negative views of Hillary Clinton. And among the less conservative GOP groups, far more rate Clinton negatively than rate Trump positively. For example, while 64% of Market Skeptic Republicans have a favorable view of Trump, fully 84% have an unfavorable view of Clinton, including 65% who express a very unfavorable view for the former Democratic presidential nominee. Barack Obama is also viewed unfavorably among most GOP groups, though views of the former president are less negative than views of Clinton. Among New Era Enterprisers, about as many have a favorable (51%) as unfavorable (45%) opinion of Obama. Majorities across all Democratic-oriented groups express favorable views of both Obama and Clinton. However, across all groups, substantially larger shares view Obama positively than view Clinton positively. Solid Liberals have almost unanimous (99%) unfavorable views of Trump, including fully 91% who express a very unfavorable view. Wide majorities of Opportunity Democrats (84%) and Disaffected Democrats (90%) also express negative views of Trump, including majorities who have very unfavorable views. A narrower 63% majority of Devout and Diverse view Trump unfavorably. On average, Democratic-oriented groups are more likely than Republican-oriented groups to say that discussing politics with people who have different opinions about the current Republican president are stressful and frustrating, with Solid Liberals particularly likely to say this. The only typology groups where opinion is relatively evenly split are New Era Enterprisers (46% interesting and informative, 44% stressful and frustrating) and Devout and Diverse (43% vs. 50%). 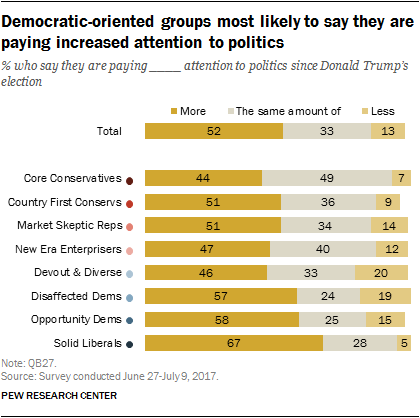 Compared with other groups, these groups stand out for their relatively low levels of political engagement. In general, people tend to have more friends who share their partisan orientation than friends who do not, and this dynamic is seen across typology groups. 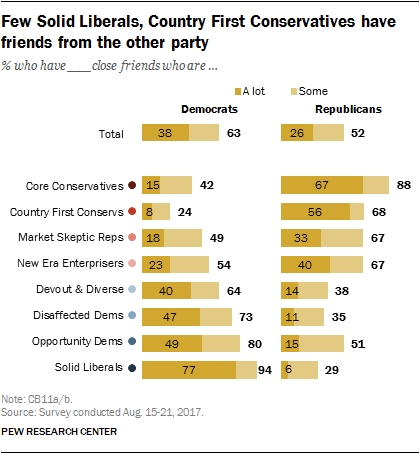 Roughly nine-in-ten Core Conservatives (88%) – who are near universally Republican or lean Republican – say they have at least some close Republican friends, while only 42% say they have at least some Democratic friends. The imbalance is even more pronounced among Country First Conservatives (68% to 24%) and Solid Liberals (94% say they have at least some Democratic friends, 29% at least some Republican friends). 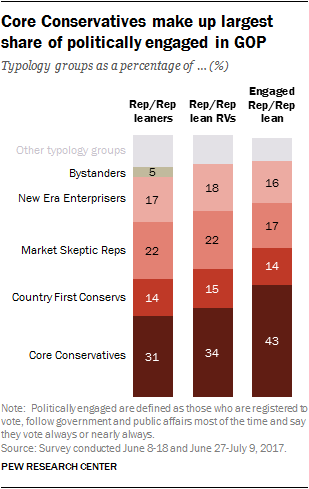 New Era Enterprisers and Market Skeptic Republicans are slightly more likely than Core Conservatives to have Democratic friends, though this partly reflects the partisan composition of these groups (11% of Market Skeptic Republicans and 21% of New Era Enterprisers are Democrats or lean Democratic, compared with negligible shares of the conservative groups). Among the Democratic-oriented groups, Opportunity Democrats stand out as being more likely to have at least some Republican friends (51% say this). 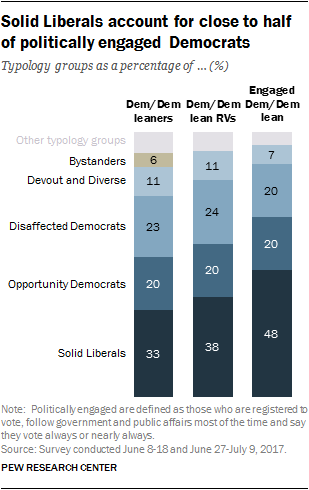 Though partisan composition accounts for some of this (15% of Opportunity Democrats identify with or lean Republican), even among Democratic Opportunity Democrats, 47% have at least some GOP friends – substantially more than in the other Democratic-oriented groups. Most Americans say that their friendships would not be affected by who their friends supported in the 2016 general election. Overall, Democrats are more likely to view a friends’ vote for Trump as a strain than Republicans are to say a friends’ vote for Clinton would strain a friendship. Solid Liberals are particularly likely to say that a friendship would be strained if someone voted for Trump: 55% say this, along with 32% of Disaffected Democrats and smaller shares of other Democratic-leaning groups. About one-in-five (19%) of both Core Conservatives and Country First Conservatives say a friend’s vote for Trump would strengthen their friendship, compared with smaller shares in other GOP-oriented groups. 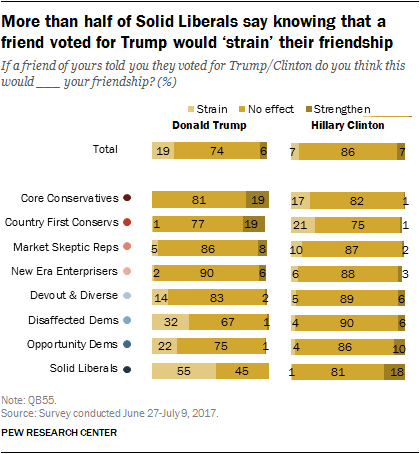 Roughly the same share of Solid Liberals (18%) say knowing a friend voted for Clinton would strengthen a friendship. The political typology groups are deeply divided along partisan lines in opinions about the size of government. And while there also are partisan gaps in views of government performance, there are cleavages within the partisan coalitions. In views of nongovernmental national institutions, Republican-leaning typology groups are divided over the impact of colleges and universities, while Democratic groups differ on the effect churches have on the country. And there are differences within both partisan coalitions in views of the impact of banks and financial institutions. Overall, the public is divided over whether the government should be bigger and provide more services (48%), or should be smaller and offer fewer services (45%). While Democratic-oriented groups are broadly in favor of bigger government, groups in the Republican coalition prefer a smaller government. Yet a majority of Disaffected Democrats (63%), a financially hard-pressed group that overall expresses a preference for bigger government, say government is almost always wasteful and inefficient. 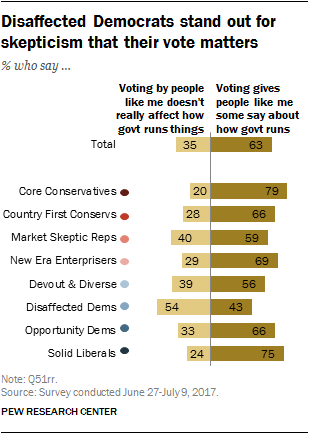 Devout and Diverse, another Democratic-leaning group that favors bigger government, are divided over whether government is almost always wasteful (49%) or often gets too little credit (47%). And while New Era Enterprisers side with other GOP-leaning groups in supporting smaller government, they are split over government’s performance (49% almost always wasteful, 47% often does a better job than given credit for). There are deep partisan differences in views of the impact of several national institutions. In some cases – notably, in opinions about the effect of colleges and universities – these differences have increased sharply over the past year. Among the political typology groups, most Core Conservatives (80%) and Country First Conservatives (60%) say colleges have a negative effect on the way things are going in the country. But other GOP-leaning groups – Market Skeptic Republicans and New Era Enterprisers – hold more mixed views of the impact of colleges, with 49% and 42%, respectively, viewing their impact negatively. Majorities of all four Democratic-leaning groups say colleges have a positive impact on the country. Views of the impact of the national news media for the most part break down along partisan lines, with Democratic-leaning groups expressing more positive opinions than GOP groups. However, Solid Liberals are the only typology group in which a majority (57%) says that the news media has a positive effect on the way things are going in the country. In assessments of the effect of churches and other religious institutions, majorities of the Republican groups view their impact positively, while Democratic groups are more divided. In three of four Democratic groups, positive opinions outweigh negative ones, but more Solid Liberals say churches have a negative than positive impact (48% to 39%). Both partisan coalitions are divided in opinions about the effect of labor unions on the country. Nearly two-thirds of Core Conservatives (65%) say unions have a negative impact, the highest share of any typology group; other GOP groups are less negative. And Solid Liberals are much more likely than other Democratic-oriented groups to have positive views of labor unions (74%). There also are sharp differences within each partisan coalition over the effect that banks and financial institutions have on the country. On the left, a substantial majority of Solid Liberals (69%) say banks have a negative effect on the country. But Opportunity Democrats are divided, with as about as many taking a positive view (42%) as a negative one (41%). Market Skeptic Republicans, a group that faces financial stress and mostly believes the economic system is unfair to most Americans, stand out from the other Republican-oriented groups for their negative opinions of banks and other financial institutions. About half say banks have a negative effect on the country (52%). The public takes a positive view of many professions: Large majorities say farmers, members of the military, police officers and scientists contribute either a lot or some to the well-being of society. But there are striking differences in these attitudes across political typology groups. 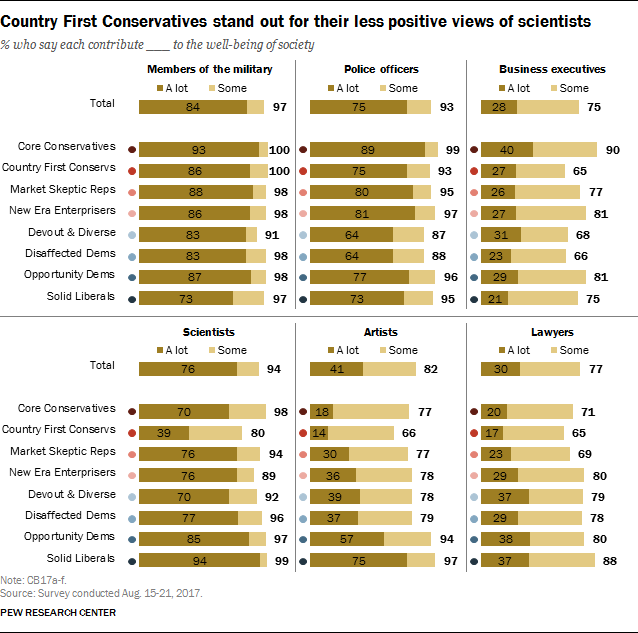 While large majorities across the political typology say that scientists contribute “a lot” to the well-being of society, Country First Conservatives are a notable exception. Just 39% of Country First Conservatives, who are older and less educated on average than most other typology groups, say that scientists contribute a lot to the well-being of society. 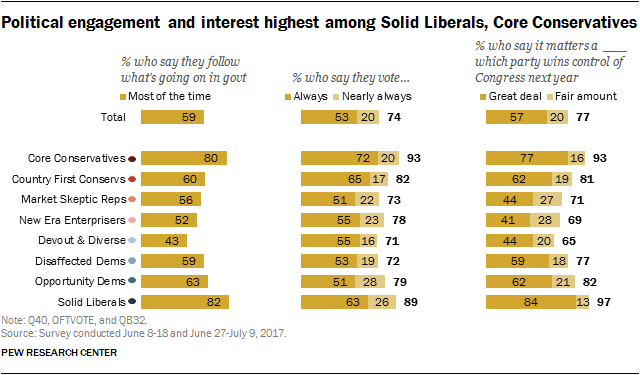 Among other groups, 70% or more (including 94% of Solid Liberals) say scientists contribute a great deal. Artists also are generally viewed positively, but just 18% of Core Conservatives and 14% of Country First Conservatives say they contribute a lot to society. Majorities of Opportunity Democrats (57%) and Solid Liberals say artists contribute a great deal to the well-being of society. Business executives are viewed fairly similarly across political typology groups, with the exception of Core Conservatives. Core Conservatives are more likely than other typology groups to say business executives contribute a lot to society (40% say this). The contributions of lawyers are generally seen more positively among Democratic groups than Republican groups. Solid Liberals (37%) and Opportunity Democrats (38%) are about twice as likely as Core Conservatives (20%) and Country First Conservatives (17%) to say lawyers contribute a lot to society. On the most important issues facing the country, a majority of Americans (56%) say there are not “clear solutions” to most big issues, while 41% say there are clear solutions to these issues. Across all of the Democratic typology groups, more think the big issues facing the country do not have clear solutions than say they do. 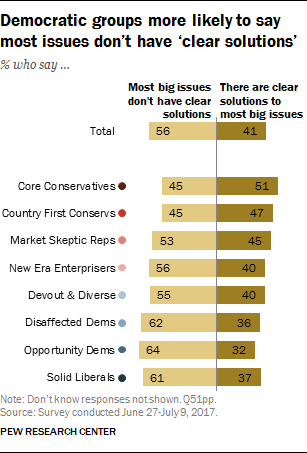 By contrast, among Core Conservatives, 51% say there are clear solutions to most big issues, while 45% say there are not. Country First Conservatives are divided (47% say there are clear solutions, 45% say most issues don’t have clear solutions). The public generally says that people with expertise on a subject do better than other people at making good decisions. Nearly two-thirds of Americans (64%) say people with expertise are usually better than others at making good decisions; 33% say they are no better at making good decisions. In general, better-educated typology groups tend to be more likely than those with less education to say that people with expertise make good decisions. Majorities of Solid Liberals (83%) and Opportunity Democrats (72%) – the Democratic groups with the highest levels of educational attainment – say people with expertise are more likely than others to make good decisions. Fewer Disaffected Democrats (54%) and Devout and Diverse (50%) say the same. 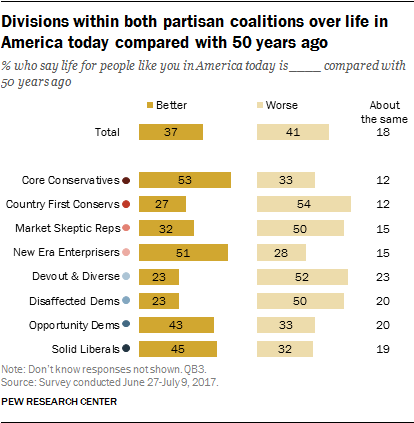 Two-thirds of Core Conservatives (66%), the best-educated Republican group, say people with expertise are usually better at making good decisions. Among Core Conservatives and Market Skeptic Republicans, which have smaller shares of college graduates, fewer say this. 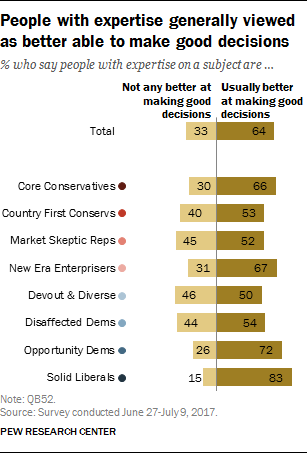 But among New Era Enterprisers, who also are less likely than Core Conservatives to have completed college, 67% say people with expertise usually make good decisions. Views of the economy and social safety net reflect the distinct profiles of the typology groups. Opinions differ among those with similar partisan leanings while still following the traditional, wide divides between the left and right. 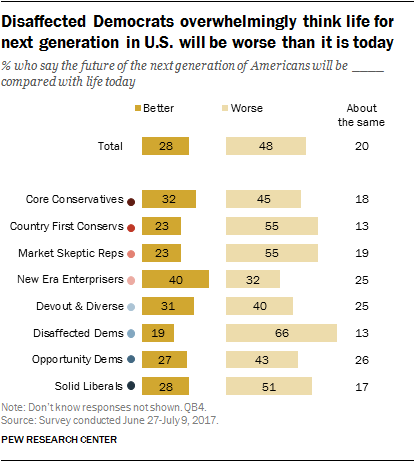 While most Americans and typology groups see economic inequality as a problem, Core Conservatives express relatively low levels of concern about this issue. 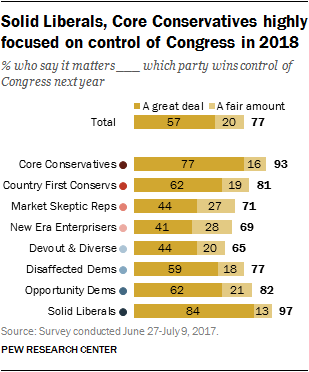 And while most Republican-oriented groups think the economic system is generally fair to most Americans, a large majority of Market Skeptic Republicans say it unfairly favors powerful interests. On the Democratic side, there is disagreement over whether hard work leads to success for most people. 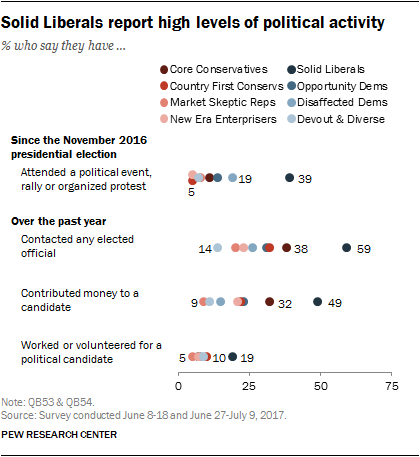 Solid Liberals are broadly skeptical, but a large share of Opportunity Democrats think most people can get ahead if they’re willing to work hard. Views of the social safety net prompt traditional partisan responses. Republican-leaning groups say the government can’t afford to do much more to help the needy, while Democratic-leaning groups say the government should do more for the needy even if it means going deeper into debt. And when it comes to two areas of current political debate, taxes and health care, the views of the typology groups are nuanced. There are wide differences between groups on the basis on partisan affiliation, but there also are gaps within the two broader party coalitions when it comes to the best way to address the two issues. Among the public overall, there are widespread doubts about the fairness of the country’s economic system. About two-thirds (65%) say the economic system in this country unfairly favors powerful interests, while just 32% say the economic system is general fair to most Americans. Democratic-oriented typology groups are especially likely to view the economic system as unfair. 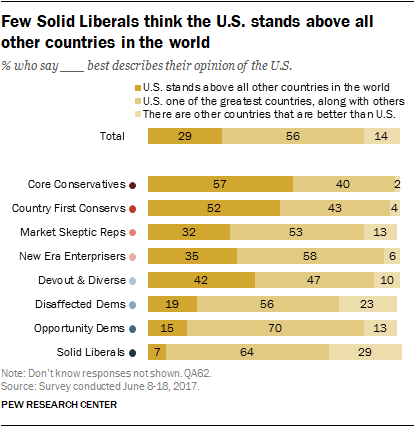 Fully 99% of Solid Liberals and Disaffected Democrats say the country’s economic system unfairly favors powerful interests. Two-thirds of Opportunity Democrats (67%) say this, as do a somewhat smaller majority (55%) of Devout and Diverse. On the Republican side, 94% of Market Skeptic Republicans say the economic system unfairly favors the powerful. By contrast, most other Republican-oriented groups think the economic system in the country is generally fair to most people. When asked about the issue of economic inequality, most Americans (82%) say it is either a very big problem (48%) or a moderately big problem (34%) in the country today. Relatively few say it is a small problem or not a problem at all. There is disagreement among Republican-leaning typology groups in concerns about economic inequality. 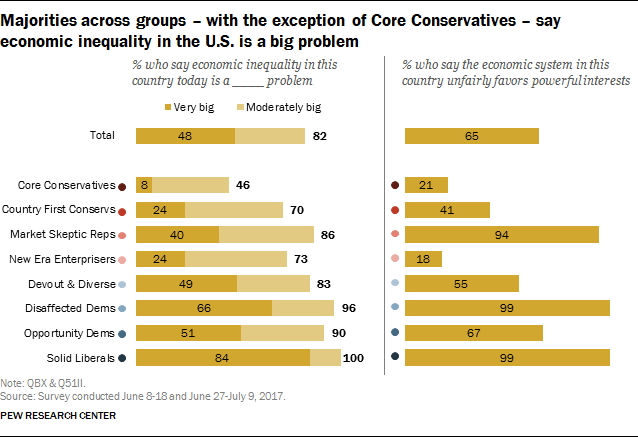 Just 8% of Core Conservatives think economic inequality is a very big problem, while another 37% think it is a moderately big problem. Clear majorities of all other Republican-leaning groups say economic inequality is at least a moderately big problem, including 86% of Market Skeptic Republicans. Broad majorities of Democratic-oriented groups say economic inequality is a moderately big or very big problem. All Solid Liberals say inequality is at least a moderately big problem, including 84% who say it is a very big problem. Among Disaffected Democrats, far more also view economic inequality as a very big (66%) than moderately big (30%) problem. Despite widespread sentiment that the economic system is unfair, most Americans continue to believe in the ability of people to get ahead through hard work. About six-in-ten (61%) say most people who want to get ahead can make it if they’re willing to work hard; fewer (36%) say that hard work and determination are no guarantee of success for most people. On the left, Opportunity Democrats and Solid Liberals take very different views of whether success is possible through hard work. By 76% to 22%, Opportunity Democrats say that most people can get ahead if they are willing to work hard. This viewpoint sets them apart from the other Democratic groups. 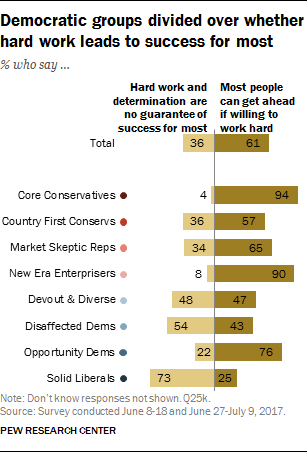 A wide majority of Solid Liberals (73%) think hard work and determination are no guarantee of success for most people. Devout and Diverse and Disaffected Democrats, both financially strapped groups, are roughly divided in their views on hard work and success. 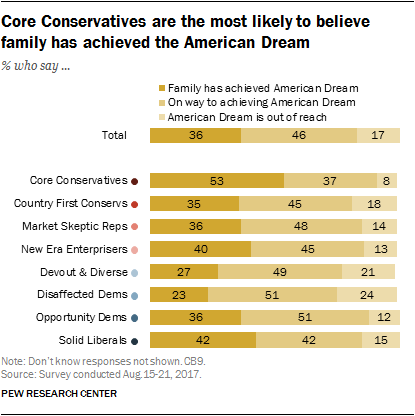 Roughly nine-in-ten Core Conservatives (94%) and New Era Enterprisers (90%) think most people can get ahead if they’re willing to work hard. 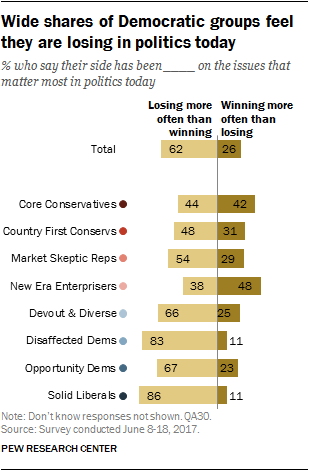 Smaller majorities of Market Skeptic Republicans (65%) and Country First Conservatives (57%) say the same. Views on the social safety net follow a liberal-conservative pattern across the typology groups, with a wide gulf between the views of Core Conservative and Solid Liberals. 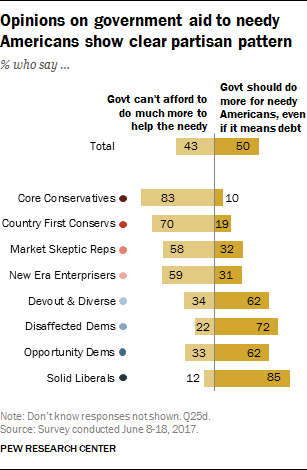 Overall, 85% of Solid Liberals say the government “should do more to help needy Americans, even if it means going deeper into debt.” Most Disaffected Democrats (72%), Opportunity Democrats (62%) and Devout and Diverse (62%) share this view. Republican-oriented typology groups take the opposite view: 83% of Core Conservatives and 70% of Country First Conservatives say the government cannot afford to do much more to help the needy. 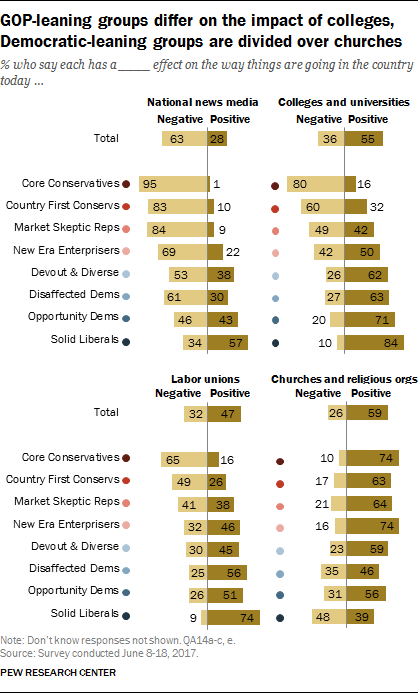 Smaller majorities of Market Skeptic Republicans (58%) and New Era Enterprisers (59%) say the same. 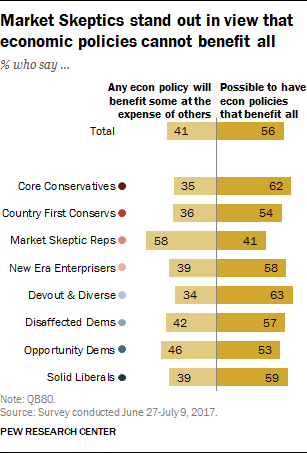 Across most typology groups, greater shares believe there are economic policies that can benefit all than say any policy will benefit some at the expense of others. And there’s rare agreement between Core Conservatives and Solid Liberals on this question: About six-in-ten among both groups say there are economic policies that can benefit everyone in the country. 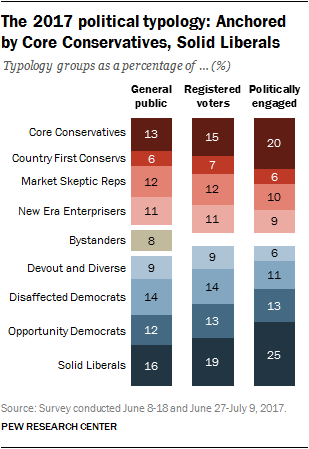 Market Skeptic Republicans stand out from all other groups in their views. A majority (58%) says that pretty much any economic policy will end up benefiting some at the expense of others, compared with 41% who say it’s possible to have policies that benefit all. Along with their opinions on business and other economic issues, Market Skeptic Republicans’ view that economic policies are inherently unfair distinguish them from other Republican-oriented groups. Core Conservatives and Solid Liberals are poles apart on the question of the government’s role in health care, but this hot-button political issue also surfaces differences among the Republican-oriented groups. And while majorities of all Democratic-oriented groups think the government should make sure all Americans have health coverage, there are differences over whether the country should institute a “single-payer” system. An overwhelming share of Core Conservatives (88%) say it is not the government’s responsibility to make sure all Americans have health care coverage. Most Country First Conservatives (72%) also take this position. A narrower 57% majority of Market Skeptic Republicans say it’s not the government’s responsibility to make sure all Americans have health care coverage. However, among the Republican-leaning New Era Enterprisers, about as many say it is not the government’s responsibility to ensure Americans have health care (50%) as say it is (47%). Among the Democratic-oriented groups, about seven-in-ten or more say it is the government’s responsibility to make sure all Americans have health care coverage. But there are differences in views about the right approach for ensuring coverage. 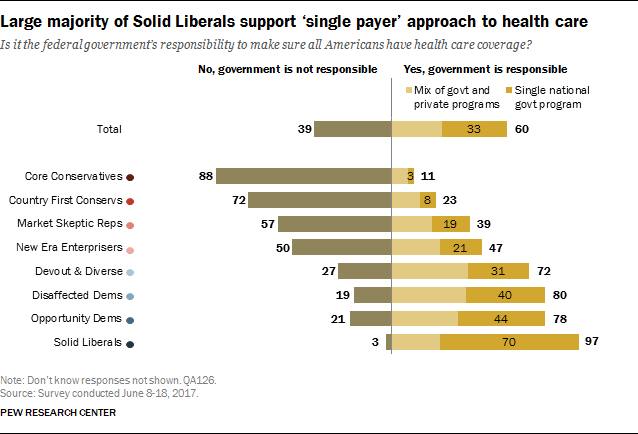 Overall, 70% of Solid Liberals say it’s the government’s responsibility to make sure all Americans have health care coverage and that coverage should be provided through a single national health insurance system run by the government; fewer (24%) say government should ensure that all have health care, but that coverage should continue to be provided through a mix of private insurance companies and government programs. By comparison, Opportunity Democrats are only somewhat more likely to support single payer over a mix of public and private programs (44% vs. 33%). Disaffected Democrats and Devout and Diverse say it’s the government’s responsibility to make sure all Americans have health care, but they are about evenly divided over the best approach for providing coverage. A 43% plurality of the public says tax rates on household income over $250,000 should be raised. About a quarter (24%) say tax rates on this income should be lowered, while 29% say these rates on household income over $250,000 should be kept the same as they are now. Views on taxes for large businesses and corporations are roughly similar to those on higher-income rates: 52% think tax rates on large businesses and corporations should be raised, while 24% think they should be lowered and 21% say they should stay the same. Core Conservatives are more likely than all other groups to say there should be lower taxes on both on large businesses and corporations (67%) and household income over $250,000 (51%). Market Skeptic Republicans, who widely say the economic system unfairly favors powerful interests, differ with the other right-leaning groups on tax policy. More say tax rates on high-earning households should be raised (40%) than say they should be kept the same (32%) or lowered (24%). And a 55% majority of Market Skeptic Republicans also says taxes on large businesses and corporations should be raised. 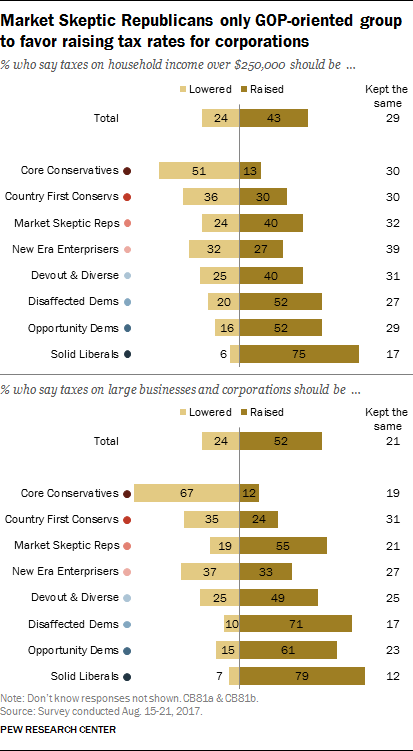 Country First Conservatives and New Era Enterprisers are largely split in their views on tax rates for corporations and higher incomes, with fewer than 40% advocating any single approach to either question. Large majorities of Solid Liberals think taxes should be raised on businesses and corporations (79%) as well as on household incomes over $250,000 (75%). Among Devout and Diverse, Disaffected Democrats and Opportunity Democrats, greater shares say taxes should be raised than lowered on businesses and corporations as well as on household incomes over $250,000. However, slightly larger shares of all three groups support higher tax rates on large businesses and corporations than on household incomes over $250,000. Wide majorities say the better way to improve the job situation in this country is “working to train people in the skills needed for jobs that are in demand” (81%) rather than “working to bring back or save the kinds of jobs that match the skills people already have” (16%). The typology groups are largely in agreement on the better approach to improve the job situation. For example, large shares of Solid Liberals (95%) and Core Conservatives (80%) say the better way is to work to train people for in-demand jobs. Country First Conservatives are the least likely to say this, though a majority still do: 62% say the better option is to train for in-demand jobs, while 30% say it’s better to work to bring back jobs that match current skills in the workforce.